Among the various VOX tube amps, the 4W AC4 has remained one of the most popular over the years, as they provide a simple and hassle free way to enjoy the rich sound of a tube-driven amp. It's loaded with a 12-in. Celestion speaker that delivers even more robust sound levels. This limited-edition AC4C112MB features eye-catching red attire that's sure to turn a few heads. This is a Class A tube amp that you can enjoy whether you're practicing at home, performing live or recording. The AC30's Top Boost sound has fascinated guitarists around the world for over 50 years. 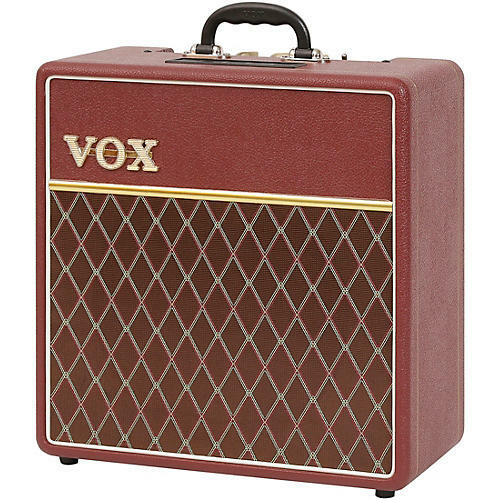 Capable of massive crunch or the clean, classic "chime," this Top Boost tone is the essence of VOX's identity. The AC4 delivers this unbeatable sound in a portable, compact body. Gain control, Bass and Treble tone controls, and a Master Volume allow any player to easily recreate this historic sound. Weight: 23.37 lbs. / 10.6 kg.